Can a body roll uphill by itself? And how much would you be willing to bet on a negative response? Probably a lot, because to answer a question apparently so absurd is trivial under the solid certainties dictated by experience. The bodies themselves go down on the slopes! Well, you will lose, because in this instrument the double cone appears spontaneously go right uphill! But any law of physics is violated. Here one of its mechanics principles (the theorem of the motion of the center of gravity) is deliberately applied in a very curious way. 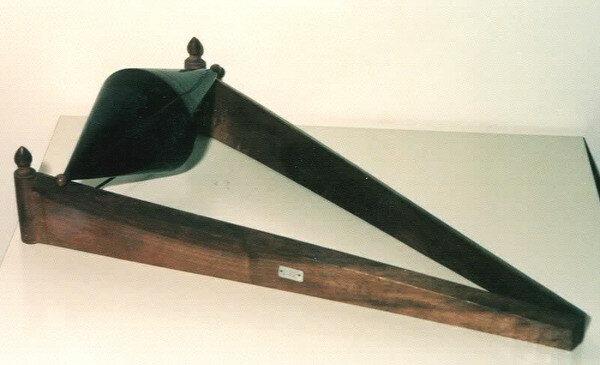 This tool, conceived in the first half of the eighteenth century, is part of a whole of still working perfectly intruments and distinguished by their high didactical efficiency. In them a certain phenomenon or physical principle is used in a original way and with the intent to surprise the viewer and force him to find a plausible explanation. As it happens in the Cartesian diver, students are encouraged to find an acceptable answer among the laws and principles explained in classroom in order to justify what has been observed. This turns out to be a mental exercise of great importance.